Col. Granada, Ciudad de México, D.F. 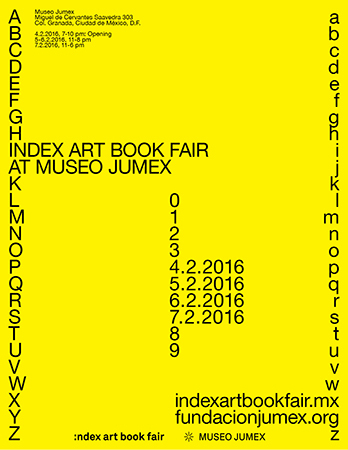 Index and Fundación Jumex are pleased to present the second edition of this leading international Art Book Fair from February 4 to 7. The Index Art Book Fair presents top independent art publishers from across the Americas, Asia and Europe. The largest fair of its kind in Latin America, Index includes more than 70 international publishers, with a particular focus on artists’ books and experimental approaches to editing, writing and print. Established in 2014, Index Art Book Fair supports and promotes the production and distribution of art publishing, an area which has become a significant aspect of contemporary art in recent years. Art publishing includes both image and text in the experimental forms of artists’ books, art writing and collectively edited magazines, alongside catalogues, critical journals and photography books. In this fertile ground, the work of international artists is made available to the public through affordable editions, as well as offering an alternative space for art alongside galleries and museums. Index Art Book Fair was founded by a group of artists, curators and designers with a long-standing involvement with art publication on an international stage. The Index team is compromised of (in alphabetical order): Jorge de la Garza, Maxime Dossin, Chantal Garduño, Tania Garduño, Kit Hammonds, Frances Horn, Erica Overmeer and Rafael Prieto. Index Architecture is an international and interdisciplinary research project concerned with the intersection between publication and architecture. Index Architecture explores how these two practices inform each other through the simple question “how do architects use the book?” Using different formats for its activities, Index Architecture aims to collaborate with relevant international institutions and individuals in the field of art, architecture, design and publishing. Index Architecture is organized by Tania Garduño and Erica Overmeer and debuts as part the second edition of Index Art Book Fair. It will present a selection of publishers addressing the current state of architectural publishing, highlighting seminal and state-of-the-art publications. Acts of Publication looks at the relationship between publishing and distribution of artists’ books to other practices of art, graphic design and curating. The three speakers have multifaceted practices that work critically between these areas. The Anamorphosis Prize was established to promote excellence, dialogue and excitement in the firld of self-published photobooks and photo-based artist books. In Print as Matter artists and curators will explore how the printed text and image become materials for the creation of new work, while the artist book and the magazine become objects and spaces unto themselves. Index Architecture discusses current experimental and conceptual approaches to publishing and architecture, this panel includes editors and architects working between these fields. The artists will present the outcome of their research at their fair table followed by a Q&A with the public. The Swiss Federal Office of Culture organizes the competition The Most Beautiful Swiss Books on an annual basis. It thereby recognizes excellence in the field of book design and production, as well as drawing attention to remarkable and contemporary books by Swiss designers, printers and publishers. In January 2015, a five-member jury awarded 17 books of 2014.